Nandi joined the rest of the world in marking the World Tuberculosis Day (TB) held annually, every March 24. The celebrations were held at Kilibwoni Health Centre, in Kilibwoni Ward, Emgwen sub county where residents were urged to work together to eliminate TB by ensuring that any suspicious cough was screened. They were also asked to practice infection prevention and control and support people suffering from TB to adhere to medication thereby working towards elimination. The event was marked by a procession through Kilibwoni market to increase awareness among the residents about TB’s prevalence and its cure. The marchers carried banners and answered questions from members of the public who sought more information about TB. 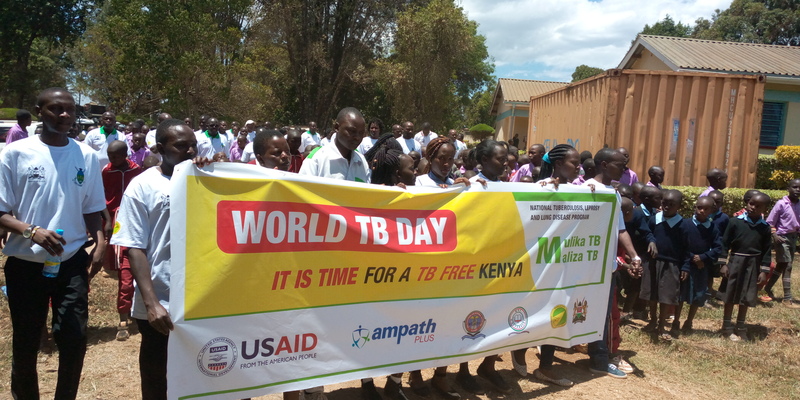 This year, Nandi County places a special focus on uniting efforts to fight TB with the county theme “It’s Time For a TB Free Nandi”, including actions to address stigma, discrimination, marginalization and overcome barriers to access care. This is essential in order to reach the target of ending TB by 2030 as part of the UN Sustainable Development Goals and the WHO End TB Strategy. World TB day, is an opportunity to raise awareness about the burden of tuberculosis (TB) worldwide and the status of TB prevention and care efforts. It is also an opportunity to mobilize political and social commitment for further progress in efforts to end TB. The CEC for Health and Sanitation Ruth Koech said the government is fully committed to supporting the department of TB control and urged residents to come out in large numbers for testing so they can know their status of TB. “TB is like normal sickness and can be treated if diagnosed early, through proper medication,” she said. According to Sammy Rop, the County TB Coordinator, TB prevalence in Nandi is at 110 per 100,000 population. The death rate stands at 8% and the defaulter rate is 5%. He said the region had experienced a problem of people not going for testing, which posed a challenge in tackling the disease. “Many people are not reached but we are trying our best so that people can learn and benefit from the TB control programme,” he said. Present at the event were Chepkunyuk Ward MCA Hon. Dr. Paul Sanga, Chief Officer Preventive and Promotive Services Sally Kemboi and the County Director of Medical Services Dr. David Bungei among other county and national government officials.